Men drink too much alcohol, eat unhealthy food and avoid going to the doctors until they are seriously ill. Indeed, some say being masculine is bad for men's health. But is the situation so simple? This deeply engaging book explores both the psychological and sociological factors that affect men and their health. It investigates how notions of 'maleness' impact on the individual's approach to health and take-up of services, and provides clear foundations for best practice in care. Part 1 of the book explores and sets the theoretical scene. It asks why disparate fields have not previously been brought together and what theoretical frameworks could be utilised to assist in this process. Parts 2 and 3 consider empirical work in relation to men, health and illness, providing critical rather than simply descriptive accounts. 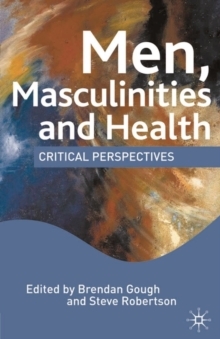 Bringing together an international collection of contributors, Men, Masculinities and Health provides fresh ideas for practice; creating a fertile terrain for future debate that will excite all those interested in gender issues. Pages: 272 pages, 3 Illustrations, black and white; 272 p. 3 illus.